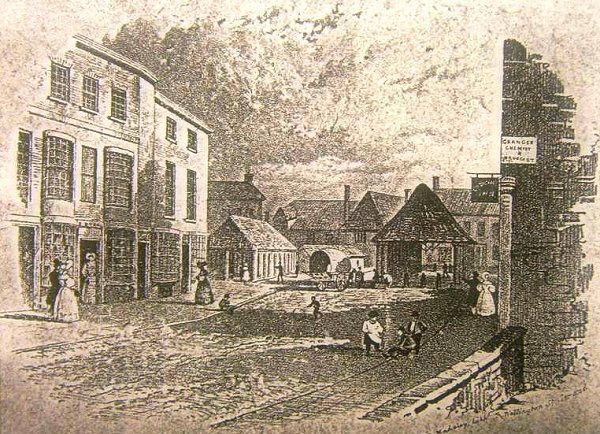 During the eighteenth century the building known variously as the Church House, Parish House, the Parish Church House or the Corner House, stood in the Borough on the corner of Middle Street and Silver Street, where the HSBC building stands today. Originally the property of the Chantry of the Name of Jesus in St John's church, by 1815 it was Peter Daniell's shop and warehouse and was the most valuable of the Church properties in town with an annual value of eighty pounds. The following description of Church House is taken from the Parliamentary Papers of the House of Commons where in 1819 a report by the Church Commissioners into the charities concerning St John's church was discussed. 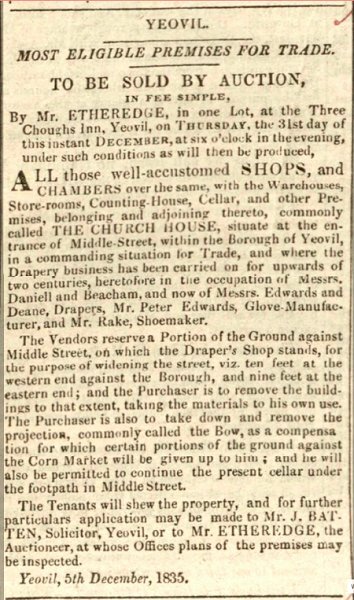 The building was described as "a messuage or dwelling-house on the corner of Pitt-lane, Yeovil, called the Church House, consisting of the kitchen and little room within the same; a large chamber over the said kitchen; the cellar; the yard, or backside; the great chamber facing the borough and market-house, with a garret or cockloft over." There was also "a shop under the Parish Church House, called the Corner House, containing by estimation in length 11 feet, and in breadth 14 feet and a half." A Vestry was held in August 1835 "to take into consideration the propriety and selling and disposing of the property called the Church House with the premises adjoining (lately belonging to Mr Daniell) to the Town Commissioners for the purpose of widening and improving the road at the entrance to Middle Street." The sale details, shown below, are particularly interesting for listing the various parts of the premises, the requirement to part-demolish and the list of occupiers. The Church House was sold by 1836 for £699 and was demolished and at its location was built London House. This sketch, made by Madeley to illustrate his map of 1831, shows the Borough seen from High Street - roughly the view seen today from the north end of King George Street. The Shambles is to the left and the Market House is to the right. The Church House is seen in the background between the Shambles and the Market House. The buildings at far left still stand today, that to the left is Clement White's shop, today's 8 High Street, at this time occupied by Benjamin Ryall, a draper, whose name appears above the door. An advertisement for the sale of the Church House in the 14 December 1835 edition of the Sherborne Mercury. The Church House was demolished just months afterwards to be replaced by London House. The Church House was demolished in May 1836.